barcode Program creates barcode label sticker ribbon asset for 36 barcode Fonts. Salon owners, like most industries today, are becoming more cost conscious and are looking for ways to become more efficient, save money and provide a higher level of service to their customers. 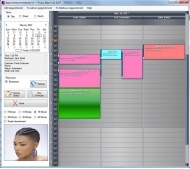 Until now, there have been very few salon software applications that meet that need. The few barbershop software applications available were either poorly built, extremely outdated or extremely expensive to purchase and run. Focus On Salons addresses all of the above concerns. Using Focus On Salons, salon can now operate with the same organization, efficiency and profit-making potential of the larger shops and chains. Salon owners can now automate their shops just like salons and spas by using software that is built specifically for them. We understand that you may not be a computer expert and do not want to hire one to run your software. This is why we have designed Focus On Salons Software to be extremely user-friendly and easy to use. We guarantee that you will be up and running with the software within 5 minutes. Focus On Salons software will provide you with the tools you need to keep your salonp profitable and successful. 5Rating Resale Rights Create HUGE keyword lists in seconds. Sort, filter, and manipulate keywords 117 different ways! Easily create and upload Adwords campaigns and groups. Reliable barcode ribbon maker software generates flexible barcode tags using several designing objects like rectangle, line, circle and square etc. Affordable barcode image generator tool creates list of colorful barcode stickers in minimum time.